Gabe Pons and Rob Landeck will be teaming up for an art show at Fredericksburg's most popular coffee shop, Hyperion Espresso, in March. (((In Stereo))) will feature new work that is inspired by the music that fuels the soul- from Rock and Hip-Hop to Jazz and Blues. 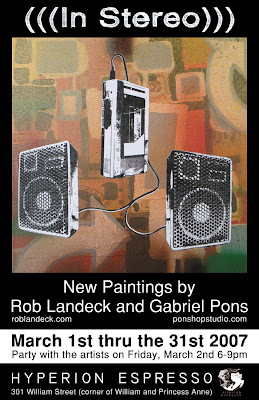 The painting in the poster above is called "Analog Roots: 1987" and is a collaborative piece by both artists. 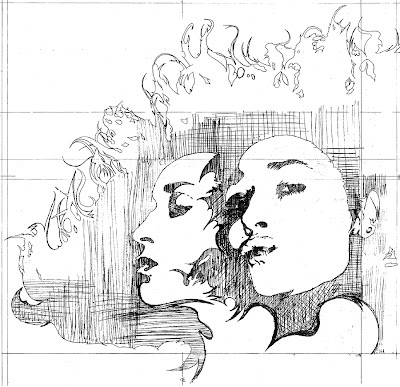 Below is a teaser sample of oneof the pieces slated to be in the show. "My Baby Wants To Rock n Roll" by Gabriel Pons: (Stencil Study), 30"x30"